James McLeod has been The Telegram’s political reporter for the past eight years. As such, his job is to report the hard news – nothing but the facts! If covering the news is akin to writing the first draft of history, McLeod’s Turmoil As Usual: Politics in Newfoundland and Labrador and the Road to the 2015 Election is the second draft. McLeod is not some armchair pundit, or anonymous social media commentator. He has had the best seat in the house over the period he writes about and has earned the right to pass on some riveting commentary. I loved his writing style – full of wit, sarcasm and lots of clichés. Unshackled from the restraints of daily news coverage which the author states “can be frantic and hard boiled, and it can obscure the larger narrative”, he builds on the narrative of the stories he has written on over the period from the fall of 2011 up to the 2015 provincial election. McLeod provides a not too particularly flattering (or totally unfamiliar) portrait of the serious business of politics in this province with balance, nuance and multi dimensionality. It is refreshing, brutal and depressing. 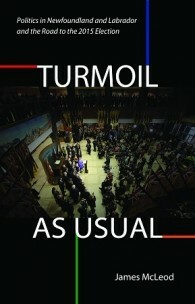 He offers an intellectually honest, frank assessment of the key events, actors and outcomes of a particularly turbulent period of time that produced five premiers (and one premier designate), caucus revolts, four party leadership contests, controversial public policy debacles and the emergence of an unparalleled financial crisis. I particularly liked how he offers alternative approaches that politicians could have used to explain thorny issues like Bill 29, Dark NL, the NDP caucus revolt and the Liberal’s failure to be accountable about fundraising. For example, in Chapter Six “Power Crisis” he offers a translation of what Kathy Dunderdale said, what she meant to say, what people heard and how she might have approached it better. His dismissal of nuisance leadership candidates and the NDP as a political force are sure to ruffle some feathers but he calls it as he sees it. More often than not he is right on the money. The truth hurts! As an opinion journalist, he helps readers think about the news, events, egos, missteps, hypocrisy, the role of fundraising, the intellectual bankruptcy of the province’s political parties, shallow ideologies, shifting allegiances and the shell game which characterizes politics in this province. For those of you that live outside the political bubble, he offers astute glimpses of how democracy really works here. The desperation to cling to power, the machinery employed to wrestle power away, the insincere talk of transparency and accountability and the herd mentality of donors, particularly businesses. Frankly, as entertaining as some of his anecdotes are, this book is a damming indictment which exposes the democratic deficit that exists in Newfoundland and Labrador. Not only is the emperor shown to have no clothing, the entire court is naked as well. After reading this book, I understand why 47% of eligible voters stayed home in a supposed " change election." Pick it-up,read it and discuss it.